1. Read the NOTES below. 2. Buy the download using the "Buy Now" paypal button. 4. Open the link we email you and follow the instructions carefully. 5. You will have 5 days to download the video after we email you the download page link. Once you download the video you will be able to watch it for as long and as many times you want until you delete it from your computer or device. You will need a computer or laptop that has the ability to "right click" (with or without a mouse). The downloadable version of the video DOES NOT have the same video quality as the DVD version had. This download is intended to have a good video quality on electronic devices with a small screen. If you intend to view the download on a computer you will have to see it on its original output video size for best quality view. The more you enlarge the video the less quality it will have. The blue rectangle below show the exact size of the video format. After 5 days, the download webpage expires and the download will have to be paid again to be able to access it. The Documentary will "under normal circumstances" take from 30 minutes to 12 hours "approximately" to download depending on the speed of your internet connection. Any aparatus capable of playing MP4 videos. ROAD TRIP: 4:46 min. This section gives you an overview of what the Venezuelan “piranha country” looks like. FISHING PIRANHA: 13:44 min. Various species of piranhas fished with hook and line and cast net in their brown silty water biotope. SWIMMING WITH PIRANHA: 27:00 min. Incredible underwater footage of piranhas in their natural habitat. This section shows you how different species of piranha behave in the wild. It also shows you what their natural habitat looks like in the rainy season and what other species of fish live with them in the wild. SWIMMING WITH PIRANHA features: Pygocentrus cariba, Serrasalmus irritans, Catoprion mento, and if you look closely probably other species of piranhas. FEEDING PIRANHA: 27:44 min. We get in the river and feed Pygocentrus cariba. You have to see it to believe it. FISH ON DVD: 3:19 min. Shows pictures and short videos of some other fish captured in the river. MUSIC COMPILATION: Autochthonous music from the Venezuelan “piranha country area”. MAPS: Shows the location of the piranha fishing areas. I just finished watching the DVD and it was as great as people (including you) said it was. Great videos and I hope for some new videos on DVD in the future. We had some bad luck with my order, the first dvd I received had some damaged sectors so I could not watch it. I greatly appreciated that you offered to send me a new one. Even that was quiet a story though, since it took more then a month to arrive ! But with some patience it turned out well eventually. Meanwhile I got to know you not only as an excellent video maker, but also as a decent and polite man who really earned my respect. I saw the Piranha 1 DVD. The underwater footage is incredible. Apart from Pygocentrus there are other very interesting shots. I think it’s the only footage of other piranhas like irritans, medinai (briefly), and Catoprion. Of coarse they have to be edited (reduced) with the best footage. It was also interesting to see the coloration pattern of Geophagus (Satanoperca) in their natural habitat. This coloration pattern is never seen in preserved fish. About the Road Trip part, let me tell you that it is boring compared to the rest of the video, sorry to be so honest. Well Ivan, this week I’ll see the other DVDs. Antonio Machado – Allison from Caracas, Venezuela. 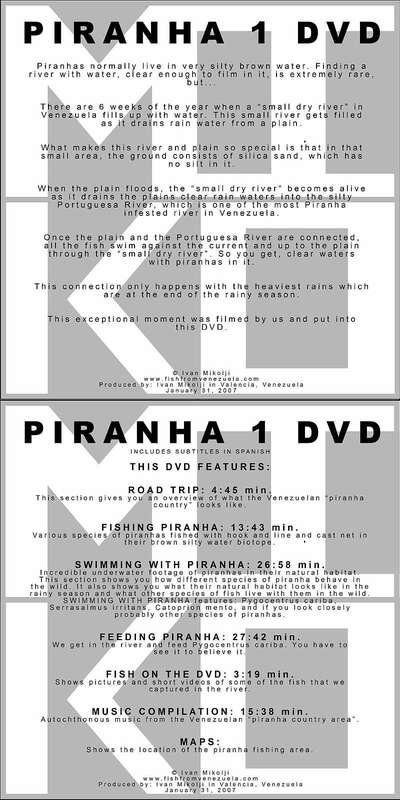 Piranha 1 DVD is an amazing homemade movie created by Ivan Mikolji that captures several species of caribe in their native habitat in Venezuela. In the footage hobbyists can see caribe fishing, feeding and habitat. More importantly many of the myths attributing caribe as man-eaters are destroyed. I strongly recommend this DVD if you collect species of piranha / caribe. Though some of the segments are very long in format, it does not diminish its educational value and certainly worth every minute of it. Also included are Venezuelan music compilation that fits the native scenario of this video. Finally had some time to sit down and enjoy the Venezuela video and must say that its probably the best piranha video coverage I have seen. It tops all the coverage done on the Discovery Channel. Makes me want to film one of my own out in the wild. :) Thanks again for sharing this with me. :) You made my day. I just finished watching the Piranha DVD, and I have to say it is absolutely brilliant. A masterpiece in filming and what great footage. Worth every penny. Thank you so much Ivan, I am 100% satisfied. I got it yesterday, thanks for asking ,it’s great I’m a moderator of piranha-fury (Netherlands) and it’s very cool to see the piranha’s in their natural habitat, the feeding part is awesome, standing in the water during feeding!!! I saw the DVD at the Opefe site and ordered it right away!! I found out about the dvd by viewing the trailers on youtube, I have a shoal of 10 caribe so often browse youtube for videos etc.. I received the Piranha 1 DVD today! I've seen the first 2 chapters and I'm really enthusiastic about it already. Thank you for making it and I wish you success in the future with your other documentaries. Freshwater stingrays would be interesting! I really enjoyed watching the movie. The underwater footage was priceless seeing the way all the fish interact underwater. Also to see how densely populated the fish were with each other was amazing. I would love to take a trip down there one day. I watched the piranha video today! VERY educational! Great specimens in the dvd. Great to know what the biotope for piranhas and all the other fish that coexist with them! I would recommend this dvd to anyone who is interested in piranha’s or has piranhas in their aquariums! Thanks again! And Great job on this dvd!